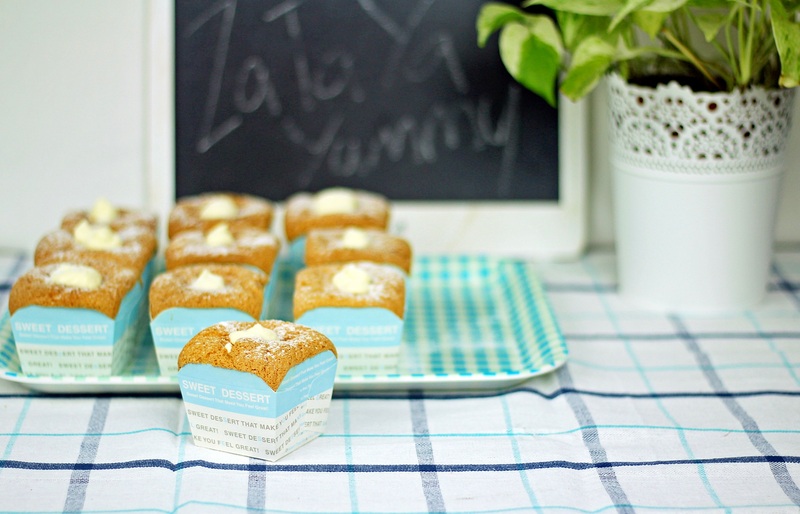 This velvety soft cupcake filled with lovely creamy custard cream, is something you will dream of it. 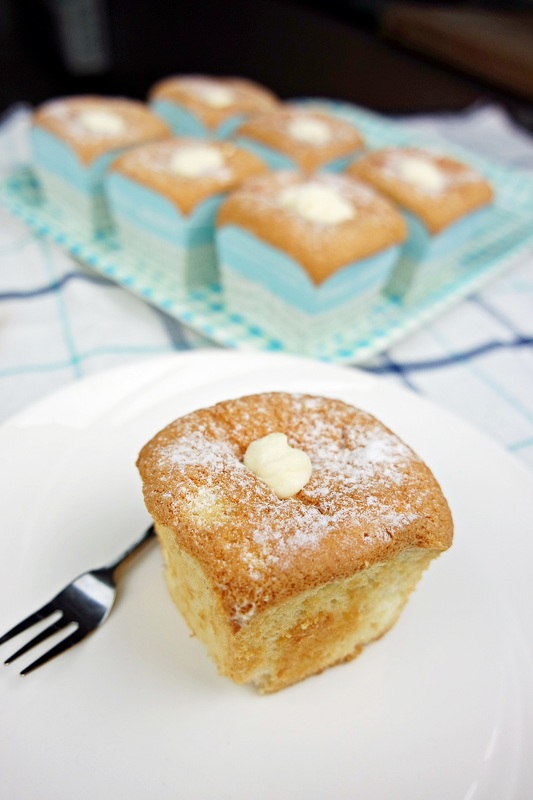 Fun fact: Hokkaido Chiffon Cupcake, also known as 北海道牛奶蛋糕, is not from Japan. It is actually originated in Singapore and Malaysia. 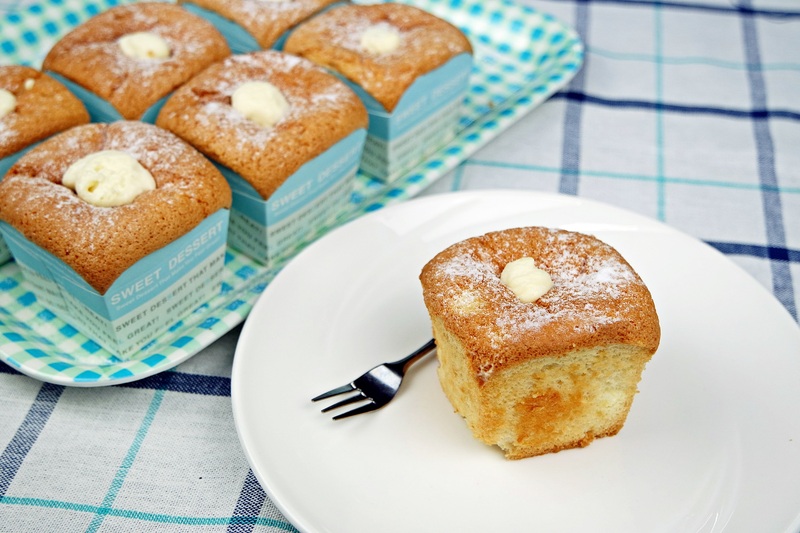 There were two theories that why we named it, ‘Hokkaido Chiffon Cupcake’. 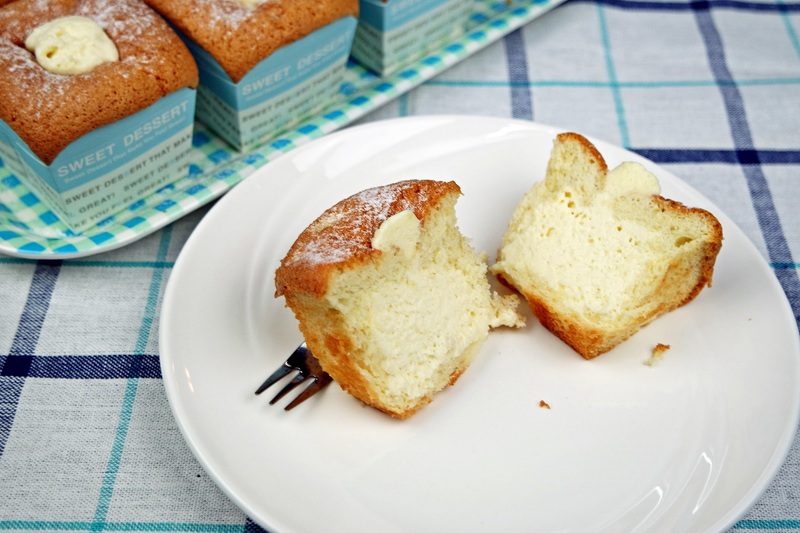 1) A chiffon cake that was made using Hokkaido Milk. 2) A cake that looks like a volcano that has a snow top and lava oozing out. Either way, this concept was beautifully created in Singapore/Malaysia and became really popular ever since. Looks good right? It is a must try recipe. A friend of mine, loves Hokkaido Chiffon Cupcake. She used to buy it every morning for breakfast. I am going to surprise her with some when I meet her! Preheat oven to 170C or 150C fan-forced. Shift plain flour, corn starch, baking powder and salt together in a bowl. In another bowl, whisk egg yolks and sugar vigorously for a minute until pale and creamy. Then, stir in milk and oil. Set aside while we make our egg white mixture. In your mixer bowl, pour in egg whites and vinegar together. Whisk on high speed until frothy. Then gradually spoon in sugar and continue mixing until stiff peaks. To combine, fold in egg white mixture a dollop at a time. Transfer them into your square paper liners. Drop the pan to raise large air bubbles out. Bake it in the oven for 20 to 25 minutes. Let it cool while you make your filling. Heat up milk until just below boiling point. In a bowl, whisk egg yolks, sugar, corn starch, and plain flour vigorously for a minute until pale and creamy. Slowly add in half of your hot milk while whisking. Transfer your egg mixture back to the pot. Cook on medium-low heat whisking constantly until thickens. Shut off the heat and immediately transfer into a bowl. Add in vanilla extract. Cover it with a cling wrap, touching the custard and let it chill in the fridge. Once everything is cooled, whip whipping cream and sugar on high speed until stiff peaks. Throw in cooled custard and whisk on medium speed for another 20 to 30 seconds until combined. 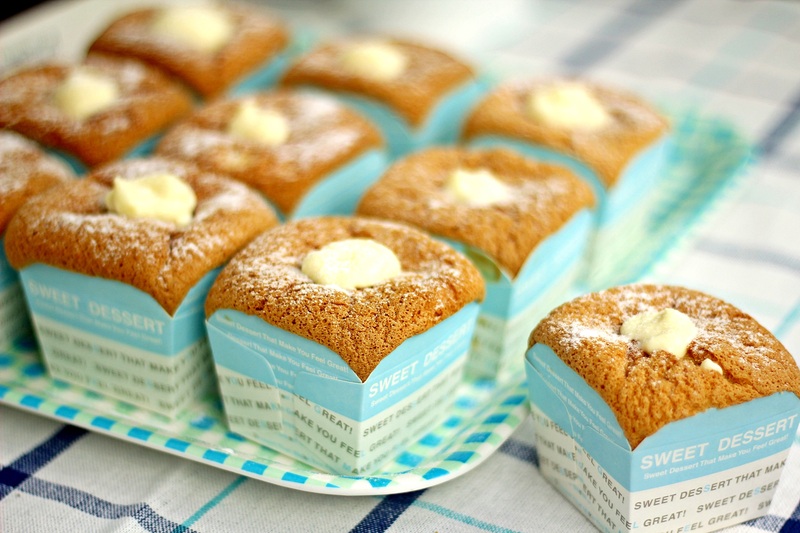 Transfer into a piping bag and pipe into the chiffon cakes. 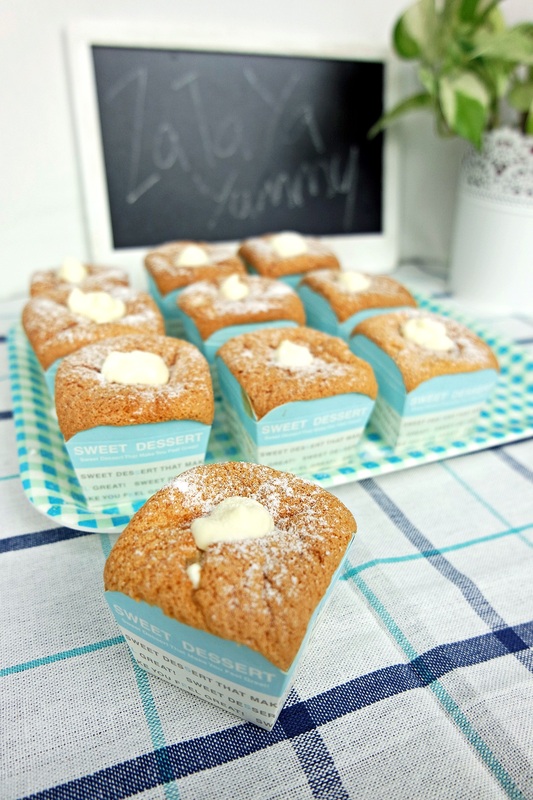 This entry was posted in All Recipes, Sweet Treats and tagged Cake, chiffon, Chiffon Cupcake, cupcake, custard cream, Hokkaido, hokkaido chiffon cupcake, Hokkaido cupcake, 北海道牛奶蛋糕 on July 19, 2015 by Zong Han Chua.